High-level conference of the Radicalisation Awareness Network (RAN). With Stefano Manservisi, Director-General of DG Home Affairs, European Commission (2nd from right). 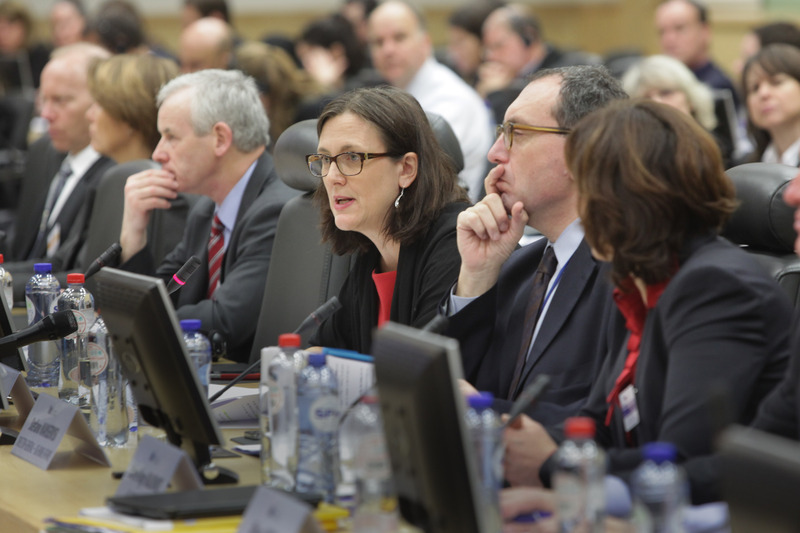 Next to him Cecilia Malmström, Member of the EC in charge of Home Affairs (third from right). (EC Audiovisual Services). Today the Commission will present a Communication entitled “Strengthening the EU’s response to radicalisation and violent extremism”. Despite the fact that the relevant Press release announcing the news stresses that “Traditional law enforcement techniques are insufficient to deal with the evolving trends in radicalisation”, the whole affair is dealt with rather as a police and security issue and not also as a crucial political topic. The Commission proposes a number of measures to counter radicalisation and extremism. The measures will be taken by member states together with the Commission and in general terms are the following: “…creation of a European knowledge hub on violent extremism, the development of trainings for frontline practitioners, supporting a conference on foreign fighters in Syria to share practices and exchanges ideas, providing financial support for projects making use of modern communication tools and social media to counter terrorist propaganda and programmes facilitating abandoning violence and the underlying ideology”. This passage puts together very dissimilar things. Radicalisation of youths within the boundaries of the European Union and the highly aggressive Muslim and other groups fighting between them in Syria, cannot be analysed, discouraged and countered by the same agencies, operatives and disciplines. It seems that the EU commits the same mistake as in the aftermath of the civil war in the former Yugoslavia. In that case the Muslim fighters were actively supported by the EU and the US without second thoughts about what those people will do after the war is over. As it turned out, those Muslim fighters became the nucleus and the catalyst in the formation of a large number of extremely violent groups, which appeared in the Muslim ghettos of the large European cities. Recruitment became a standard practice of those groups which even fed the Al Qaeda fighting units in Afghanistan and elsewhere in the world. All those issues related to the Muslim extremism have nothing to do with the internal and home-grown political and social extremism within the EU. For example, the 17 November terrorist group in Greece is not an isolated case in this country. There are many extremist groups having terrorism built into their ideology. The extensive moral nihilism and the corruption are still reigning in the political life of this country and the complete chaos in the public service does not exist to serve the people, but only the members of the mainstream political parties. This reality has created a fertile ground for extreme ideologies in both sides of the political spectrum. Large parts of the Greek population are in economic and psychological despair, offering a favourable environment for recruitment in extreme ideologies and practices. To a lesser degree the same phenomena also appear in Italy and even Spain. This is home-brewed terrorism fed by the economic catastrophe in the south of Europe. There is also mafia terrorism reigning in some parts of Italy, and the Balkans. Of course there are differences of origin and practices in various countries. In Italy mafia gangs were always there, while in the Balkans they appear with the abrupt dissolution of the communist regimes and the lawlessness that followed. The dark practices in privatising the huge state business sector is at the heart of the mafia formations in the ex-communist EU countries. Once those unlawful groups prevailed in the economic life, they continue today to behave and do business and politics in the same way. *promote security, justice, democracy and opportunities for all more vigorously. However those anti-extremism and anti-terrorism policy lines are so vast, that is difficult to conceive how they can be practically applied. For example how is it possible to de-radicalise large parts of the Greek population, while unemployment is at 28% and more youths are unemployed than those with a job? Or how is it possible to ‘win the minds and hearts’ of the radical Muslim youths in the ghettos of the large cities in Britain and France? As for the last key proposal (opportunities for all) this is easily said but impossible to realise. Unemployment will continue to ravage countries, cities and neighbourhoods in the foreseeable future. In short the Commission has to do more analysis of this phenomenon and come up with appropriate and realistic proposals. of your posts. Several of them are rife with spelling problems and I in finding it very bothersome to inform the reality then again I will certainly come again again.